Dendrodrilus rubidus is a small, litter dwelling earthworm native to Europe that has invaded areas of Australia, South America, Canada, Russian Federation United States and a large number of sub-Antarctic islands. The combined impacts of this species and other exotic earthworms are having profound effects on forest ecosystems in North America, particularly in regions which lack native earthworms. Exotic earthworms rapidly consume leaf litter, thereby altering nutrient cycling and availability and other soil properties. This has cascading effects on microbial communities, invertebrates, vertebrates and seedling establishment, and may alter entire plant communities and threaten rare plant species. Dendrodrilus rubidus is a small (< 10 cm) highly pigmented epigeic earthworm (Hendrix & Bohlen, 2002). Four subspecies or morphs of Dendrodrilus rubidus are known: rubidus (Savigny, 1826) tenuis (Eisen, 1874), norvegicus (Eisen, 1874) and subrubicundus (Eisen, 1874) (Frenot, 1992). Dendrodrilus rubidus cocoons are extremely cold tolerant, surviving temperatures lower than -40 °C. However the adult stage is unable to withstand even slightly negative temperatures. Thus only the cocoons overwinter in cold climates (Berman et al., 2010). Dendrodrilus rubidus is used as a live bait by anglers, and is also used for vermicomposting (Keller et al., 2007). Dendrodrilus rubidus is common in coniferous forests in its native European and introduced North American range (Addison, 2009). It is an epigeic species which inhabits and feeds in the litter and organically enriched surface layers of soil (about 0-10 cm depth) (Hendrix & Bohlen, 2002). It is acid-tolerant (Addison, 2009), and the cocoons are extremely cold tolerant, surviving temperatures lower than -40 °C. However the adult stage is unable to withstand even slightly negative temperatures. Thus only the cocoons overwinter in cold climates (Berman et al., 2010). Troglophilic (cave-dwelling) behaviour has been observed in D. rubidus in Alabama, Georgia, South Carolina, Tennessee (Reeves et al., 1999) and in eastern Canada (McAlpine & Reynolds, 1977). Dendrodrilus rubidus includes both sexual and parthenogenic morphs (Frenot, 1992). Dendrodrilus rubidus is an epigeic species. It inhabits and feeds in the litter and organically enriched surface layers of soil (about 0-10 cm depth). Epigeic species facilitate the breakdown and mineralisation of surface litter (Hendrix & Bohlen, 2002). Epigeic species tend to possess more cellulase enzymes than anecic or endogeic earthworms, reflecting their diet of relatively undecomposed organic matter (McLean et al., 2006). 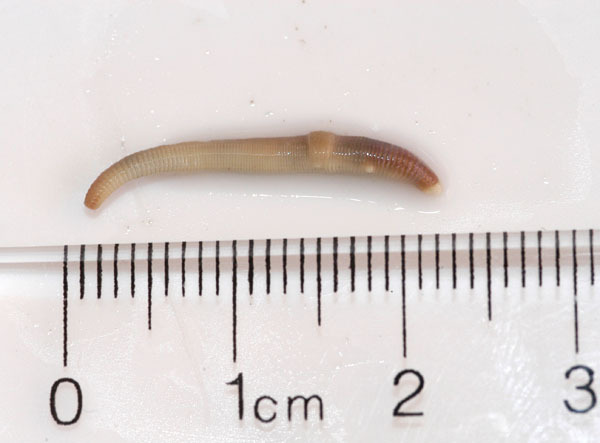 Earthworms, especially Lumbricus species have high calcium demands and strong litter calcium preferences (Reich et al., 2005 in Holdsworth et al., 2008). Their high calcium demands may be necessary to supply their well developed calciferous glands, which produce cal¬cium carbonate that could moderate blood CO2 levels and pH when soil pCO2 levels are elevated (Holdsworth et al., 2008). Calcium content of litter is thus a predictor of litter preference among earthworms, and consequently decomposition rates and litter mass loss (Holdsworth, 2006 in Holdsworth et al. 2008). When Europeans first colonized the United States midwest they probably brought earthworms as adults or cocoons in dry ship ballast (Hendrix & Bohlen, 2002).Road vehicles are thought to be a major vector for the spread of earthworm cocoons (Cameron et al., 2008). Epigeic species are more easily transported in this manner as they are present close the litter surface (Cameron et al., 2007). In fact Cameron & Bayne (2009) found that the probability of earthworm occurrence and extent of spread increased as road age increased in Alberta. Recommended citation: Global Invasive Species Database (2019) Species profile: Dendrodrilus rubidus. Downloaded from http://www.iucngisd.org/gisd/species.php?sc=1697 on 21-04-2019. Informations on Dendrodrilus rubidus has been recorded for the following locations. Click on the name for additional informations. European Environment Agency. Undated B. Dendrodrilus rubidus.